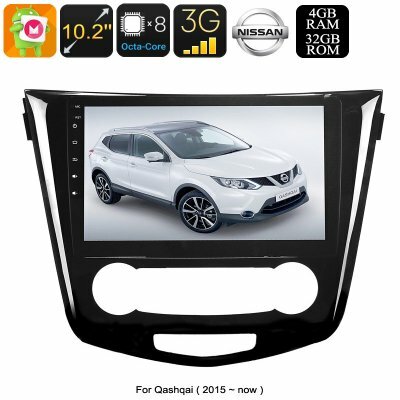 Successfully Added One DIN Android Media Player - For Nissan Qashqai, 10.2 Inch, Android 8.0.1, WiFi, 3G&4G Support, GPS, Octa-Core, 4GB RAM, GPS to your Shopping Cart. With this one DIN car stereo for your Nissan Qashqai (Model 2015 – 2017), you will be able to head out on your upcoming road trip with confidence. It features a highly accurate 20-channel GPS navigation system. Thanks to this, you can be assured that you’ll always reach your destinations in the fastest way possible. No longer will you have to worry about taking along your map and getting lost in a foreign country. Simply insert the Android map of your liking, and this car GPS will bring you to your destination in no time. With this feature at your side, you’ll be able to fully enjoy your future holidays without the annoyances and distractions of accidentally taking a wrong turn. Naturally, this car media player has much more to offer than only its GPS. It runs on an Android 8.0.1 operating system that brings along plenty of entertainment possibilities for you and your passengers. With its Octa-Core CPU and 4GB RAM, this 1 DIN Android media player is capable of handling basic Android applications. Your passengers will be able to watch movies and play games straight from your dashboard. A beautiful 10.2 Inch display is in place to let you enjoy all media in crisp HD resolution. The car stereo even supports WiFi and 3G which means you’ll be able to stay connected to the web at any time. Like any car stereo, this one DIN car media player supports both FM and AM radio frequencies. On top of that, it lets you play MP3 and MP4 files. It even can be synchronized with your smartphone or tablet through Bluetooth. This means that you’ll always be able to listen to your favorite tracks in great audio quality. With CAN BUS support, your new car gadget even lets you browse through your songs and adjust the volume by simply using the buttons on your steering wheel. This makes it easy to select the song of your liking without being distracted. 32GB internal memory, SD card, and USB support bring along enough storage for you to keep all your music, maps, and other sorts of media files. This car media player comes with a 12 months warranty, brought to you by the leader in electronic devices as well as wholesale electronic gadgets..